We humans are social beings who cannot survive without relationships. Any relationship involves at least two people who come together willingly to share their lives and it is said that sound relationships are the true wealth of an individual. Sound and healthy relationships mean relationships that stand strong through thick and thin irrespective of their own set of conflicts and disagreements. Be aware of what you want from the relationship. Communicate your needs to the other person. Do not expect all your needs to be met. Be ready to discuss and cooperate on the things you want from one another. Avoid expecting your partner to change in order to meet your needs. Empathize with your partner. It is not necessary to agree, but it is necessary to understand and respect it. Be willing to work honestly towards minimizing the differences, wherein there is negotiation from both ends. Always maintain mutual respect, be it in private or in public. Team up with each other. See yourselves as two unique individuals coming together with different perspectives, strengths, and differences that add value to your relationship. 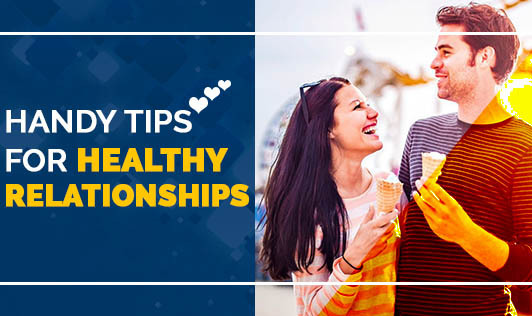 If you sense a disturbance in your relationship, convert the above statements into a checklist and check the ones that are lacking and need focus to make it healthy and sound.